Like in any mobile phone or tablet device, besides inserting SIM card – you can use memory card for additional storage space. Samsung Galaxy tab device supports microSD or microSDHC memory cards with maximum capacities of 32GB. 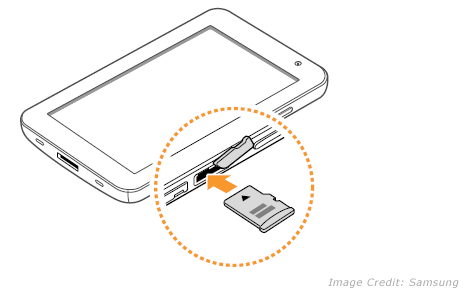 You can easily insert and use memory card to store more media files like photos, videos and other type of files on your Galaxy Tab tablet device. 1. First open cover of the memory card slot as shown is screenshot below. 2. Now insert memory card with the gold-coloured contacts facing down. 3. Then push memory card in the memory card slot until it locks in place. 4. Close the memory card cover to complete install. You need to unmount memory card before removing the actual memory card to ensure safe removal. 1. In the Menu mode. goto Settings > SD card and phone storage > Unmount SD card. 2. Then open the memory card cover. 3. Push memory card gently until it disengages from the device. 4. Pull memory card out of the memory card slot. 1. To format memory card goto Menu mode. 2. Then goto Settings > SD card and phone storage > Unmount SD card > Format SD card > Format SD card > Erase everything. Do I have to format my brand new card in the Tab FIRST before putting music on it at my pc? Or is it ok to just add the music from my pc onto the new card then inset it into the tab? Leuk hoor die uitleg. Ik heb een Galaxy S maar geen geheugen sleuf…niet te vinden en ik ben echt niet gek of simpel. Ik heb gisteren een extra Micro SD kaartje van samsung binnen gekregen middels een actie van ze maar ik denk dat ik hier dus helemaal niets aan heb tot mijn eigen grote frustratie en ongenoegen. Nice to hear that explanation. I have a Galaxy S but no memory slot … not to find and I’m really not kidding or simple. I have yesterday an additional Micro SD card of samsung received through an action of them but I think I have absolutely nothing to my own great frustration and discontent.